The foundation of a thriving downtown Rochester encompasses more than a desirable housing market. Consider the case of Flint, Michigan where a bad official decision to save money on public water infrastructure has resulted in the lead poisoning of many children and a drinking water crisis. When you cannot drink the water, breath the air, or if your built infrastructures (transportation, water, waste, telecommunications, and energy) are crumbing, even a cheap McMansion will be undesirable. In a changing world, where the past we knew is not an indication of our future prospects, one of the most dramatic changes Rochester and its downtown hub will experience is Climate Change. Our housing market, our job prospects, our public health, and everything else we hold dear will not thrive if our environment (our life support system) is collapsing. In the past we developed and advanced under the delusion that our environment would take care of itself despite our environmental interference. Things have changed. Or rather, our recognition of our incredible negative effects on our environment has improved—culminating in our growing awareness of Climate Change. Our environment is a much more sensitive biological system that we previously thought. The Paris Agreement, agreed to by almost every nation in the world, should if nothing else remind everyone everywhere that sustaining a viable future must include an urgency to act at every level. 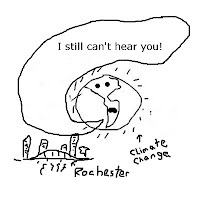 A year ago City Newspaper reported “Rochester to undertake citywide climate inventory” (January 21, 2015) and it looks like the city is finally getting around to it. How robustly the city embraces the community-wide Climate Action Plan (CAP) and other ‘green’ initiatives could determine whether we remain a desirable place to live regardless of downtown development. Rochester is and will be experiencing many changes due to the great warming but not as much as many other areas whose ability to get enough fresh water, maintain farm productivity, and protect themselves from extreme weather will fail long before these vital elements fail here. Rochester has been slowly addressing Climate Change, although we have yet to reach the degree of concern equal to the threat. And the public has not been engaged. · Rochester’s OFFICE OF ENERGY & SUSTAINABILITY http://www.cityofrochester.gov/article.aspx?id=8589936085 You can download the Energy Management and Climate Action Status Report here! In other words, Rochester government is changing its energy profile, assuming I suppose that if they lead on energy efficiency, conservation, and reduce their greenhouse gas emissions the public will follow. But if the public doesn’t know that Rochester is leading, the message is lost. Rochester has increased their focus on active transportation (walking and bicycling), which not only increases the likelihood that more folks will want to live downtown, but also decreases our fossil-fuel transportation system’s effects on our health and greenhouse gas emissions. But we have not educated the public about the importance of active transportation in combating Climate Change, we see the same old conversations about different transportation modes while the elephant sits in the room ignored. 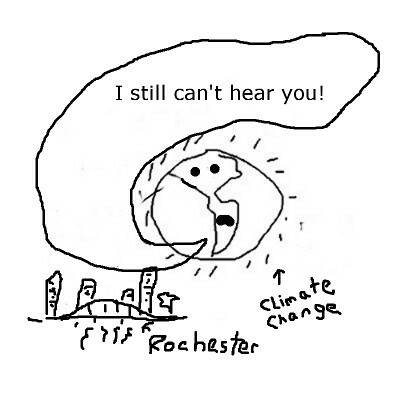 Rochester has talked about its commitment to addressing Climate Change. But it has not demonstrated its concern to the public in a consistent manner that engages the public or the local media. Climate denial and its devastating obstructionism is still rife in our community. This means we are still talking about solving our existing problems and orchestrating our future development as if Climate Change doesn’t exist. Other areas, including other cities in our country, do not have this problem because they’ve presented their communities with strong climate action plans. Because of climate refugees, downtown Rochester will probably grow in numbers—one way or the other. The best way would be to ready ourselves by planning and educating the public to gain their support. The other way, business as usual, will be madness. Ultimately, the most important attraction for a city will not be its snazzy architecture. It will be the likelihood of its prolonged sustainability, and its perception among the affluent that it will flourish.